The TF2 update machine rolls on with the official announcement of Mann vs Machine, along with the recent Sleeping Dogs tie-in. So why don't I care? Day one of the MvM update has brought us the usual banquet of comic strips, preview movie and a conspicuously vague map screenshot. There isn’t really all that much gameplay information to gush over at this point, but anyone who was already excited about the prospect of a horde mode in TF2 will likely be more than satisfied. It’s also nice to see Valve continuing to push the envelope with their excellent TF2 comic series by adopting more of an interactive visual novel style than in their more traditional but nonetheless just as witty and charmingly drawn publications. Unfortunately this update is arriving just after the surprisingly mediocre Pyromania and Triad Pack updates, both of which have served as a reminder of how long it has been since Valve made a good map. Doomsday fell disastrously short just for being a terrible idea in general, and Kong King seems thus far to be subject to similarly widespread disdain, as well as belonging to the sadly underrated king of the hill genre. During Pyromania, I found for the first time ever that it was harder to find a vacant player slot in a decent server that wasn’t playing the new map than in those which were overplaying it into oblivion, as all previous update experience has taught them to. And who can honestly say they are still wearing the pyrovision goggles? The Balloonicorn, ashamed at its own existence. 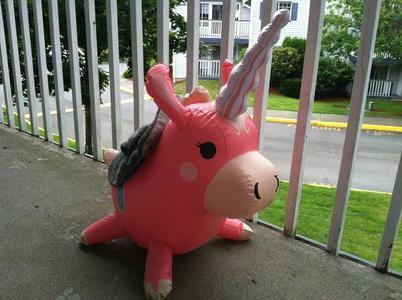 New content is being delivered at a faster rate than ever, which in the universe of random item drops means that players are becoming ever less likely to find the new weapons they want by just playing the game. 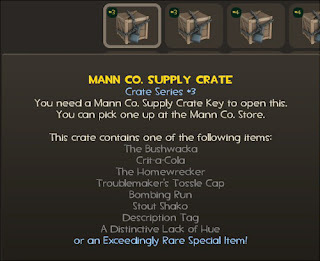 This is greatly compounded by the fact that several of the updates have introduced time-locked items which are only obtainable through the nauseating and incredibly expensive ritual of crate opening, until Valve sees fit to initiate them into the craft and random drop roster. 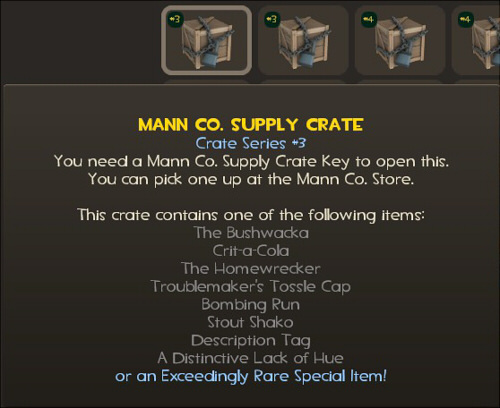 This would appear to be a slightly ungracious effort to strangle the TF2 trading community, whose efficiency and bargaining power were quite obviously unsurpassed even from day one, and hence monopolise the market for new items. When it comes to crates, the only winning move is not to play. It’s easy to see why Valve is allowing this to happen, since the free to play model depends on the ransoming of precious shiny objects to players by their scheming corporate overlords, but they seem to be forgetting the crucial fact that some of us actually paid for the game in the first place and would like to reclaim our stake. I’m not saying that we haven’t got our money’s worth, far from it, but it feels like a rather callous departure from the methodical and purposeful structure of the Class update era. Back then, the updates were at least loosely based on a system of incentive and reward, as players would be encouraged to play the class(es) of the hour to unlock achievements which would in turn bestow new items - arguably a much more transparent and fair system than the present deluge of updates has given rise to. At this point, trying to improve TF2 by adding more stuff is like trying to improve chess, or "Deal or no Deal"; they are already perfect incarnations of what they are meant to be. These are just some of the reasons why I don’t play TF2 nearly as much as I used to, and I definitely don’t look forward to updates any more. Besides all this, I just don’t think anyone wants yet another new pyro axe. I play TF2 whenever my other steam games are all done or not working, but only when I come home from uni. I can't imagine a scenario, short of the apocalypse, where I wouldn't still play TF2.